We want to make a difference and it starts by pouring our heart and soul into our chocolates so you can enjoy the flavor using quality ingredients with authentic cacao chocolate, made from scratch. Nothing artificial or processed is used in our chocolate candies, bars, and truffles. Steph’s passion for food, music, art and, in particular, chocolates culminated from her many years of traveling throughout the world as a sports therapist. Her international exposure inspired her to combine her art with chocolate in 2016. She created Bella Sophia Chocolates, named after her daughter, as an artisanal hand painted chocolate company. Steph has studied and immersed herself in every aspect of chocolate making from the highest and purest quality of Cacao, to farming and harvesting, to fermenting, roasting and grinding, all for the love and dedication for making her internationally inspired chocolate creations. Steph’s recipes come from her creative vision and influences she’s learnt from some of the world’s best chocolate masters. Steph grew up surfing the California Coast, backpacking, running marathons and is a black belt in taekwondo. JD has worked as a chef for 5 years, in finance for 23 years, and in education for 8 years and has a degree in Business and Management. These fields were perfectly suited to complement the other half of Bella Sophia Chocolates operations. In addition to managing the finances and post production processes, JD is also well-versed in every aspect of chocolate making. JD enjoys world travel, international cuisine, fine champagne, marathon running, walks with the dog, outrigger paddling, the cinema, and time with family. 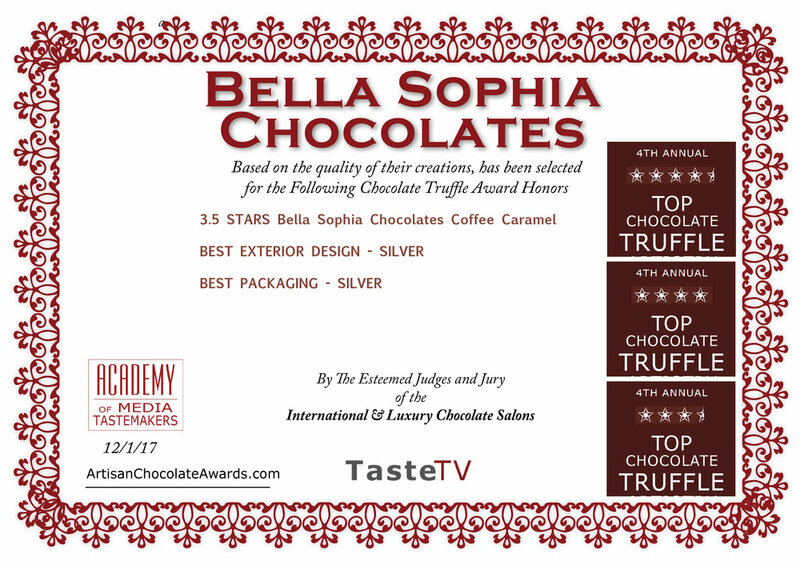 Since December of 2016, Bella Sophia Chocolates has done more than refine an old tradition: We've started a new one. Guided by an international palate, we fuse unique flavor combination techniques from around the world to create award winning flavors and textures. Bella Sophia Chocolates carefully handcrafts in small batches from our kitchen in Orange County. To achieve optimal flavor, our products are sourced from local and regional farmers using only the finest and when available organic items. With no additives in our chocolates, we are able to highlight the exceptional quality of our chocolates. 2nd Annual VALENTINE’S CHOCOLATE AWARDS Competition. Are you interested in learning more about chocolates as a small business? There are many how-to books on starting an enterprise, but often the best advice comes directly from those with actual experience. Thus came the idea for this book; this "primer." Why not ask chocolatiers firsthand what they have experienced and what they recommend? With this concept in mind, we composed a set of key questions and asked them to interesting artisans from around the world with experience in either making chocolates & confections, chocolate business ownership, or both. Their answers on creativity, product, branding and business are very frank and often personal, and written in a journal or diary style. The information in the resulting primer is worth its weight in gold. Includes chocolatiers such as The Oakland Chocolate Company, Mink Chocolates, Waialua Estate, Aelan Chocolate, Dean'sSweets, Bella Sophia Chocolates, La Châtelaine Chocolat Co., Fera'wyn's Artisan Chocolates, Endorfin Foods, Mignon Chocolate, Amella Caramels, Solkiki Chocolatemaker, Delysia Chocolatier, Michael's Chocolates, Soulever Chocolates, SELEUSS Chocolates, Forte Chocolates, cōchu chocolatier, David Bacco Chocolatier, Finding Fine Chocolate, and flying noir. THE CHOCOLATIERS PRIMER, Available in March 2019.